I’ve said it before. I don’t typically play video games until they are couple of years old. I’m not a serious enough gamer to pop down money on a game I may or may not like. I used to rent most games before I would buy them. So late last year I picked up a pack of Assassin’s Creed I & II for $10. I liked the look of the game enough to want to try it. The bad part of this way of playing games is that by the time I’ve played them and learned that I like them, most of the collectibles are gone. So I’ve missed some previous version of Altair and the Assassins that came after him. Due to frequent Walgreens trips for various other collectibles, I saw the new McFarlane version of the original game. Now I suspect that this is a version seen in a later game. There are some details that just don’t quite match up, but more on that later. 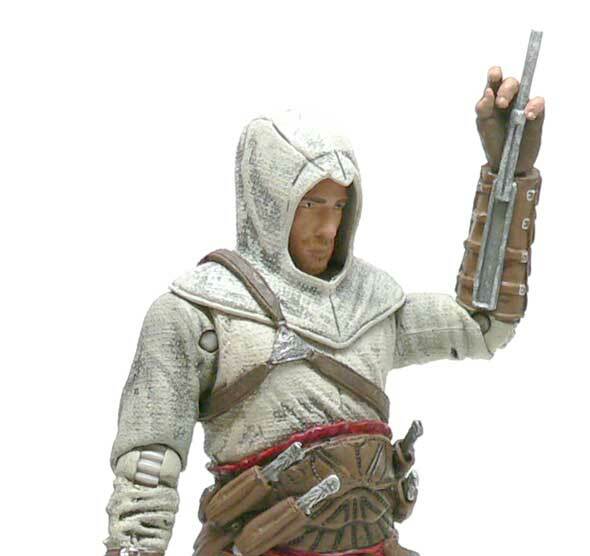 The overall look look is close enough that you can tell this is Altair. Mainly, his peaked hooded seems to close in on the front. And this is something that I both like and dislike about that figure. It’s one of those things that looks good depending on the angle a bit. The hood is sculpted as separate single piece that is molded in a semi flexible rubber. The head appears to have a ball joint possibly, but it is pretty much rendered useless. Looking at him from any angle above straight on looks okay. However, From straight on, the hood looks like it is sitting too high to me. Even from the side it seems like The hood sits up a bit too high in the back. Maybe he has a helmet or a lot of hair under there. The face looks a bit off from the game one to me. But, since it’s the player character, I’m going to get to upset. It just seems a bit longer to me than the one in the first game. I have to say I don’t buy McFarlane figures very often. I’ve had good and bad experiences with them. This is one of the better ones. The sculpt and paint work together really well and really remind me of the times when they were at the top of their game. Altair is a far cry from some of the stactions they have produced over the years. The majority of his outfit is white robes. the top is sculpted and the bottom “skirt” is rubber. The whites match up and are helped with a nice grey wash. All of it has a bit of a coarse cloth texture. Really for the scale, I have no complaints. The details over the robe look pretty good as well. Especially, the wrist guards. The left has the ornate metal pieces that act as as shield or close combat blocker. All of this looks the way it should and gives the impression of different materials. The same goes for the back of the figure. 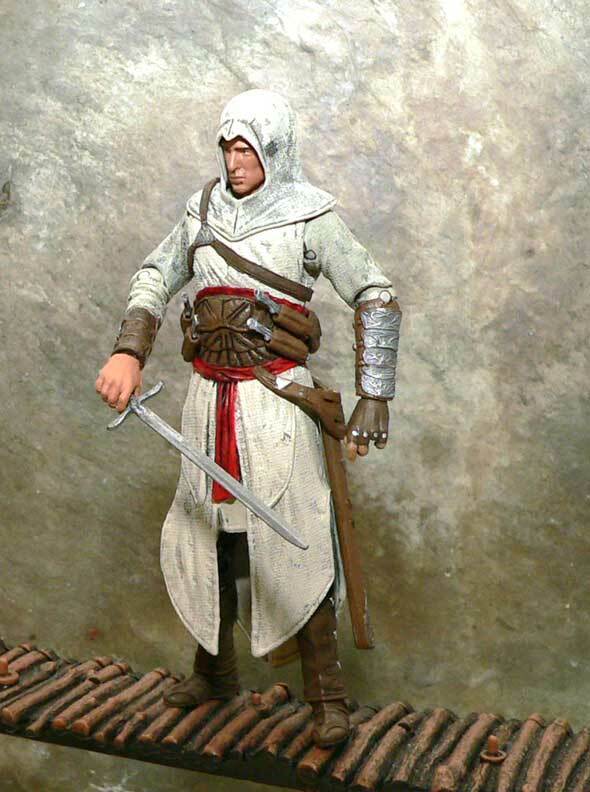 Where this normally where most figures seem to fail, Altair is complete all the way around. The chest harness is a bit odd. I’m assuming it’s because it’s from a different game than one I’ve been playing. Towards the end of the end of the first game you get extra throwing knives and they are tucked into a holder above the right shoulder, but they sit up a bit higher. 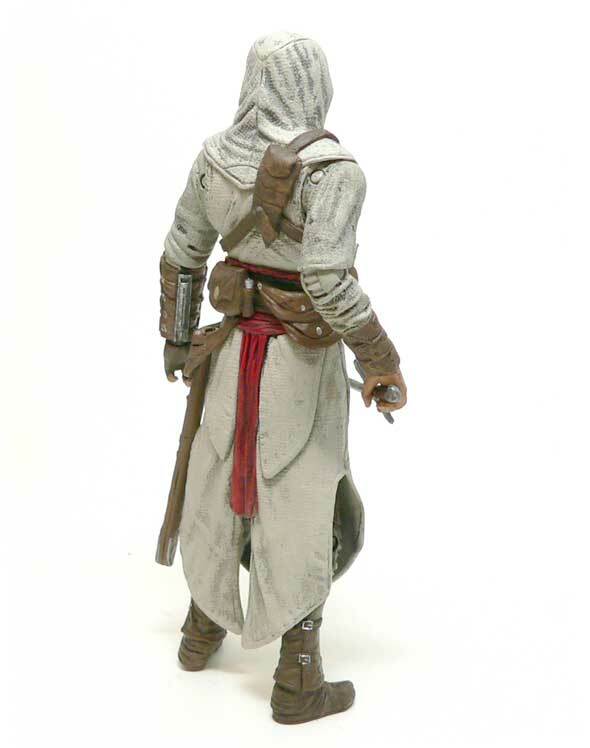 Also, Altair has a small blade strapped to the middle of his back. This does seem to very among the different versions, though. The basic articulation of the figure isn’t bad. Ball jointed shoulders, elbows and knees and hips. The wrists have a ball and disc joint that is a bit funky to operate. It moves easy, but almost too easy. The hand spins on the joint so it can be a bit difficult to get it to where the wrist will snap. The easiest way I’ve found is to snap it down in what ever direction it will go and then use the hand as a handle to turn it to where you want it. The feet are simple ball and socket joints. Because they are a bit limited by the pants, they tend to pop of a bit easier than I would have liked. Speaking of popping off. There is no actual waist. There’s a pin joint there, but it is used to hold the skirt between the crotch piece and the upper body. It’s keyed on both pieces. I know you are asking how I found this out. I thought the paint was sticking and applied a little extra pressure to it. It turned out of the keys and popped the torso up. Remember when I said the basic articulation wasn’t bad? That’s true, except any deep knee stances are completely limited by the skirt of his robes. So essentially, Altair has to fight standing straight up on his legs. Sure the knees and ankles help you get him to stand well. 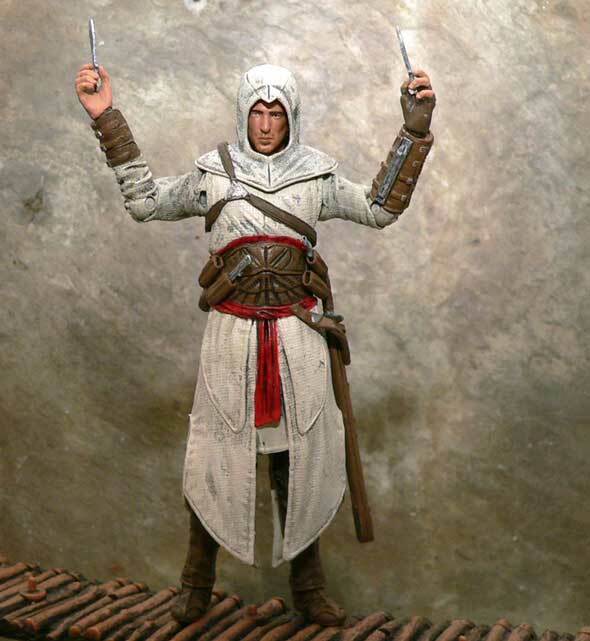 Check out NECA’s version of Ezio to see how much better this ability makes him look. After inadvertently splitting him in half, I was surprised that the hips are actually more limited by the crotch piece than I expected. However, I’m guessing they knew the skirt was there and weren’t worried about how it looked or how far it could move. I’m not a customizer. I don’t repaint figures to make them look better. With Altair, I think I’m going to make an exception. I’m probably going to try to cut the robe apart at its’ natural breaks. I’ll probably end up losing the little white piece in the front under the red sash, but I’m not that concerned about that. Also, I will probably try to add a tad bit of forward movement to the hips by removing some material from the front of the crotch piece. I was actually surprised by the number of weapons Altair has with him. He has them in the game, but I expect some of them to be more sculpted details than actual accessories. Especially the throwing knives. They small flat and grey with a wash. They fit in four sheaths on his sash. They fit really well. Honestly, I think the sheathes look pretty good with the knives in them and it’s nice to have a place to store these little tiny accessories. 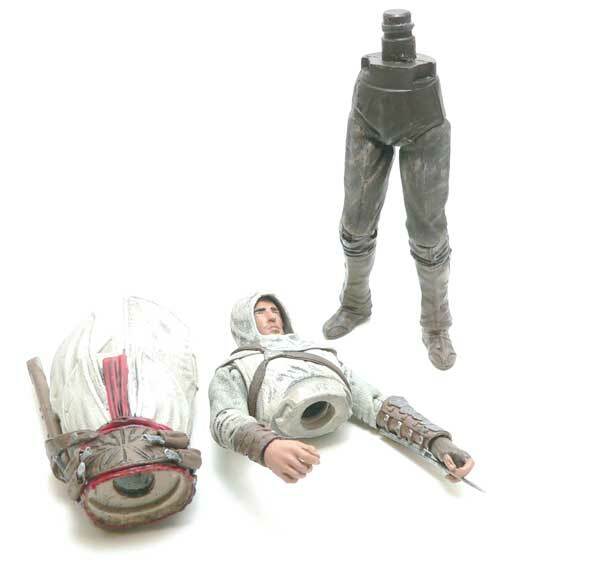 When I first took Altair out of the package, I thought he was broken. He was missing the ring finger on his left hand. I’d forgot that little detail from the game. His ring finger is removed to permit the use of the hidden blade. One of his trademark weapons, Atlair’s hidden blade is retractable. When it’s out, he can strike with it at the end of a punch to the gut. Most of the actual “assassinations” in the game are completed with this move. 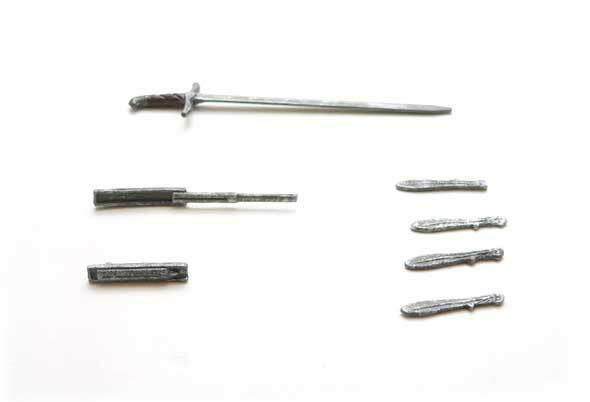 To accurately portray the hidden blade, they give you both an open and closed version. They peg, rather securely I must say, to his left forarm. The sculpting is different for both and it’s a nice little detail piece. I’m glad I was able to pick up a version of Altair. He definitely has the look of the character and great set of accessories. If he only had the range of motion to support them, he’d be an A range figure. Looks like a pretty solid figure, all around. The hood does look as if he had a skullcap under it, but the level of detail seems pretty satisfying. Plus, it is always interesting (for me, at least) to see how these figures are constructed.